Yellow-throated Warblers are a rarity in New York State and as I mentioned earlier this year they are usually considered an “overshoot,” that is, a bird that usually breeds further south that occasionally flies past its breeding grounds during migration before realizing what it has done and turning around to go back to where it belongs. There is a slight exception a bit to the east of New York City in the Town of Oakdale in Suffolk County. 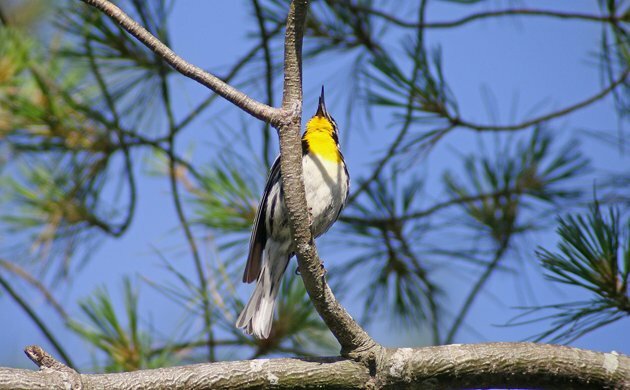 There, in Connetquot River State Park where I have seen some cool birds in the past, a few Yellow-throated Warblers persisted last year past the time we birders thought they should stick around and, sure enough, they were eventually confirmed as nesting. I did eventually track one down there, though it took me several tries, and this year I wanted better looks. That explains why Seth Ausubel and I were at the gate to Connetquot shortly after six in the morning this past Sunday only to discover that the gates are locked until eight. D’oh! We spent the two hours we had to wait doing a fruitless seawatch at nearby Robert Moses State Park and failing to find the White-faced Ibis that has been irregularly seen on Captree Island. When eight o’clock rolled around we were back at Connetquot and listening for our quarry. It didn’t take long for us to hear one, but it took a bit longer to actually lay eyes on it. But when we did, wow, what a show! It sang, foraged, switched trees, sang some more, foraged some more, and so on and so forth for a good twenty minutes. What’s not to like about a gorgeous wood-warbler singing its heart out on a sunny day? I even took some video though the wind moving the branches around made it tough to get good footage. I did my best but it’s not great. 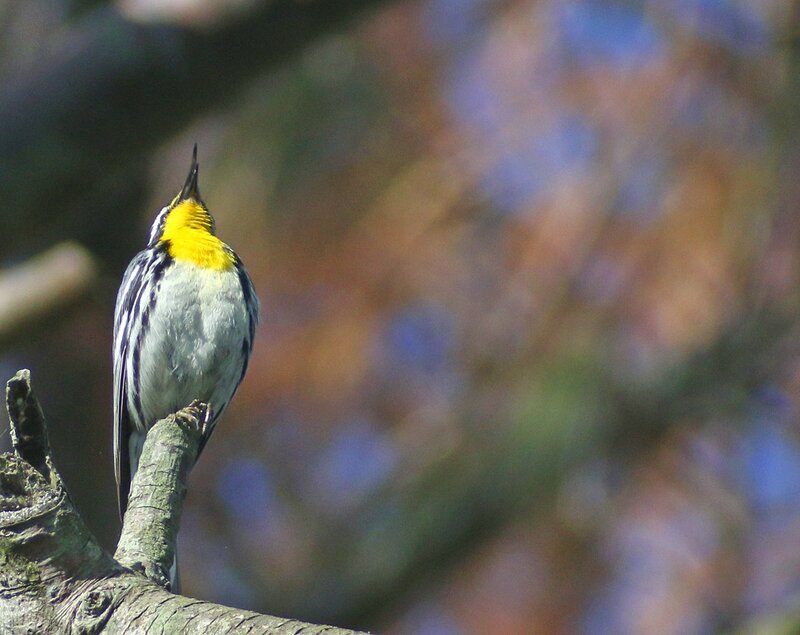 At least you get to hear the song of a Yellow-throated Warbler in the video. It sure was great to watch and, even better, we heard a second bird! Though its identity was not in doubt we wanted to lay eyes on the second bird so we reluctantly departed from the first bird and found ourselves unable to find bird number two before it stopped singing. So, back to bird number one! And it was still singing! What a great bird to see and digiscope! 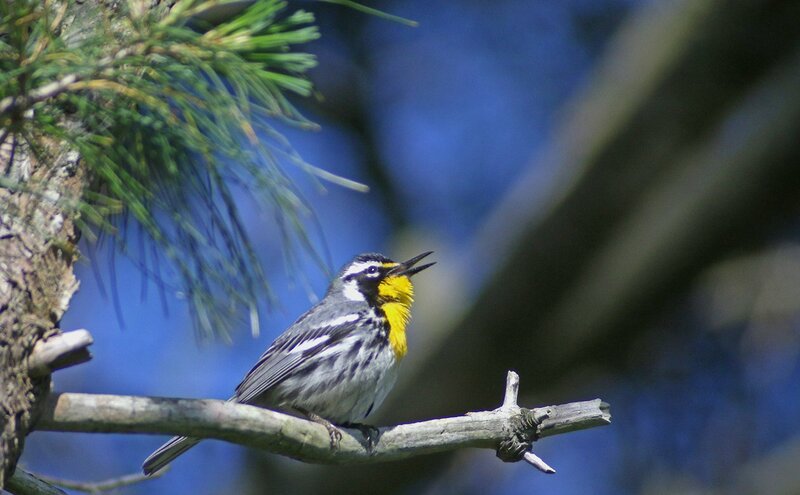 If you go looking for the Yellow-throated Warblers at Connetquot please remember that they are a rarity as a breeder in New York State and should not be disturbed. Keep your distance, don’t use recordings of their songs, and don’t try to spish them out. Just appreciate them from a distance and hope that they manage to stick it out and multiply! Wow, what a spectacular bird, and great photos! Sometimes I wonder how birds get their names, but this one is quite accurate! It does have a rather obvious name, doesn’t it? What??? 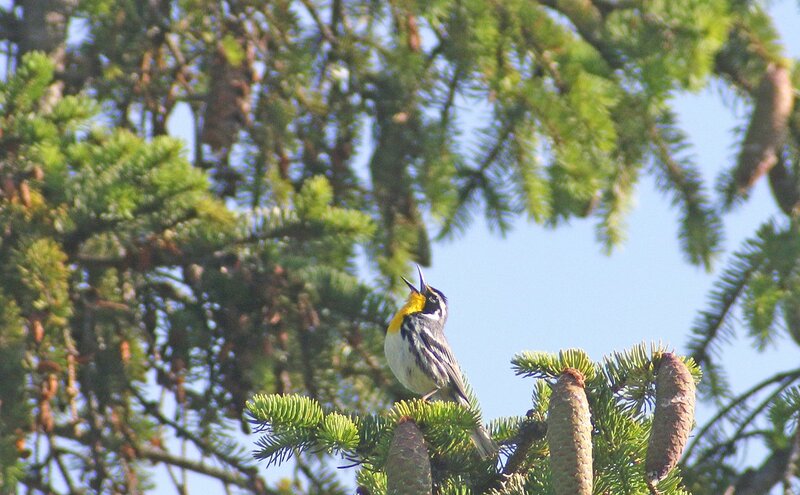 I was CERTAIN Yellow-throated Warblers were invisible and could only be heard. Weren’t they the reason the ABA allowed its members to count “heard only”, and not the dragging-chains-through-bogs thing? I am confused, Corey, thoroughly confused. Your confusion is understandable. Imagine how Seth and I felt! Here in Miami yellow-throateds are pretty common. It is interesting how early they arrive after breeding. By early July I can usually find them, and often earlier! By April most are gone, but they can be found later. I’m referring only to birds in the city. They are quite distinctive while here. Mostly they are solitary, creeping around palm crowns and flowers such as royals and coconut. Their sweet chip gives them away, and are remarkably tame and often completely oblivious to the crowds. 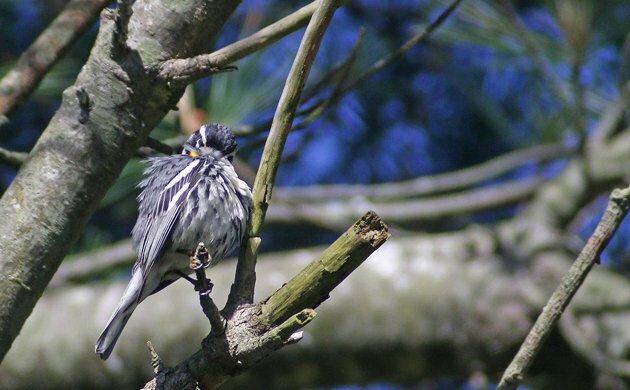 Sometimes, like last year in a local park on Miami Beach, they will join a mixed species winter flock (one of the great highlights around here) and creep around tree trunks and branches. I’m so accustomed to seeing them alone in the palms, calmly enjoying the big city, that they seem out of place in a forest flock!